FC Peterborough before their win over Brotherhood Sports. (No order): Imtiaz Ali, Mohammed Younis, Asam Ali, Anees Ahmed, Azad Hamid, Faizal Ur-Rehman, Hamad Javed, Zohaib Iqbal, Hamza Akram, Talham Muhammed, Arslan Ali, Jihad Hassan, Azi Sharifi, Klodjan Memaj, Zahid Choudhary. FC Peterborough are bang on course for a third successive Peterborough League promotion. A crucial 2-1 win over Division Three title rivals Brotherhood Sports last week sent Imtiaz Ali’s side nine points clear at the top of the table. Action from FC Peterborough's 2-1 win over Brotherhood Sports (blue). Photo: David Lowndes. But Ali is too wise a manager to believe his side are home and hosed. Anyhow there is something missing from his side’s rise through the divisions and he wants that to change this season. “This is our third season in the Peterborough League and we have been promoted in each of the two previous seasons,” Ali stated. “But we finished runners-up in Division Five and runners-up in Division Four so we are very keen to actually win a title. “Brotherhoods won Division Four last season so this was a big game for us. Before the game they could overtake us with their games in hand, but they can’t now. “We took them by surprise in the first-half, played really well and took a 2-0 lead. Action from the Peterborough League Division Three match between FC Peterborough and Brootherhood Sports (blue). Photo: David Lowndes. “They changed formation and tactics after the break and put us under pressure, but we coped well and could have scored more goals on the break. “We lost some experienced players this season, but we have some very talented young players who could play at a higher level. Hopefully they will get the chance with us. Hamza Akram and Zohaib Iqbal scored the goals against Brotherhoods for an FC Peterborough side who have won eight of their 10 league games. FC Peterborough and Brotherhood Sports players get stuck in to each other. Photo: David Lowndes. Stamford Bels, 2-0 winners at Uppingham Reserves, are second in Division Three, a point ahead of Brotherhoods. FC Peterborough tackle Uppingham in a PFA Junior Cup tie tomorrow (November 26). The top teams in the Premier Division are in cup action tomorrow. Leaders Netherton United, runners-up last season, host United Counties Division One side Desborough in a Northants Junior Cup tie. Peterborough Sports won that competition last season. They are represented by their reserve team this season and they entertain Blisworth. Moulton Harrox are in Lincs Junior Cup action at North Somercotes, while Pinchbeck are at home to Holbeach United Reserves in the PFA Senior Cup. Pinchbeck have won every competitive game since August 23 - a run of 12 matches. Premier Division teams Sawtry (home to Bluntisham) and AFC Stanground Sports (home to St Neots Reserves) and First Division Riverside (away to Eaton Socon) all attempt to join ICA Sports in the semi-finals of the Hunts Intermediate Cup tomorrow. 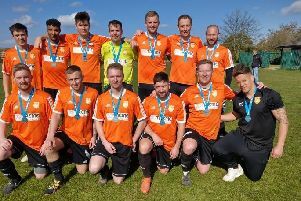 ICA claimed a notable scalp in their quarter-final last weekend (November 19) when beating Cambridge Premier League side Hemingfords United 2-1 with goals from Dave Kilby and substitute Simon Farrow. Premier Division: Crowland Town v Leverington Sports, Deeping Rangers Res v Uppingham Town, Ketton v Langtoft United, Thorney v Wisbech Town Res. Division One: Kings Cliffe v Baston, Oakham United Res v Long Sutton Athletic, Peterborough Polonia v Glinton & Northborough, Spalding United Res v Oundle Town, Sutton Bridge United v Wittering Harriers. Division Two: Leverington Sports Res v Ramsey Town, Whittlesey Athletic ‘A’ v Netherton United ‘A’. Division Three: Bretton North End v Farcet United, Eye United v Sutton Bridge United Res, Oundle Town Res v AFC Stanground Sports ‘A’. Division Four: Holbeach Bank v Netherton United ‘B’, Stamford Lions ‘A’ v Tydd St Mary Res. Division Five: Eunice Huntingdon v Parson Drove, Glinton & Northborough Res v Feeder Res, Ramsey Town Res v Kings Cliffe Res, Wisbech Town Acorns U21 v Peterborough NECI. Pinchbeck United v Holbeach United Res, Stilton United v Warboys Town. Moulton Harrox Res v Stamford Belvedere, Spalding Town v Whittlesey Athletic Res, Tydd St Mary v Netherton United Res. Parkway Eagles v Pinchbeck United Res. AFC Stanground Sports ‘B’ v Whittlesey Athletic ‘C’. FC Peterborough v Uppingham Town Res, Long Sutton Athletic Res v Rutland DR, Parkside v Brotherhood Sports, Whaplode Drove v Thorpe Wood Rangers, Whittlesey Athletic ‘B’ v Stamford Belvedere Res. Feeder v Premiair, Huntingdon Rovers v Cardea, Leverington Sports ‘A’ v FC Peterborough Res, Wittering Harriers Res v Holbeach United ‘A’, British School of Sport v AFC Orton, Riverside Res v Orton Rangers. AFC Stanground Sports v St Neots Town Res, Sawtry v Bluntisham Rangers, Eaton Socon v Riverside. North Somercotes United v Moulton Harrox. Netherton United v Desborough Town Res, Peterborough Sports Res v Blisworth James King.